The Better Homes programme for Royal Borough of Kingston upon Thames started in 2012 and will be completed in 2017. The target for the Kingston is to exceed the government’s minimum standard for housing (Decent Homes), which will mean, for the tenants: warmer, better insulated homes and a reasonable state of repair to modernise the facilities, including increased security. The Royal Borough selected Soundcraft for the first and the second phases of its front entrance doors (FED) replacement programme. The selection was based upon best value, demanding health and safety criteria, sustainable sourcing (FSC timber), financial strength, expertise and Secured by Design (SBD) compliance. 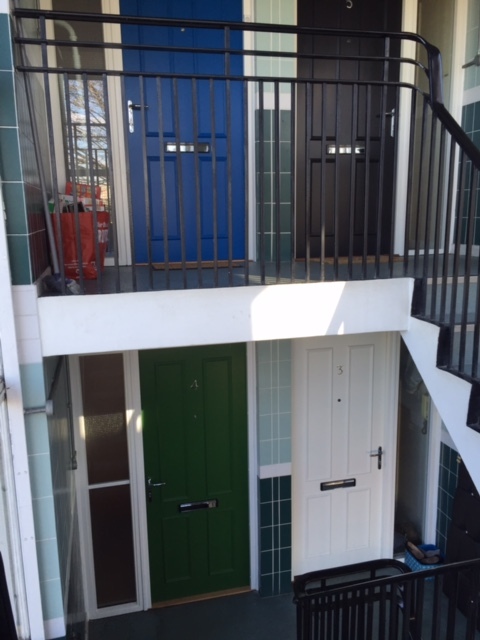 Soundcraft’s contract consisted of the manufacture and installation of over 1400 SBD FED doorsets; the residents were offered a choice of five colours, and special provisions were made for the most vulnerable and elderly. The installations were boroughwide rather than focused on specific areas, which provided a number of logistical challenges. Installations took place in a variety of buildings ranging from individual houses to blocks of flats; low rise maisonettes to tower blocks. The geographical spread of the operations and the range of specification options required careful planning and resource management from initial surveying to final snagging and sign off. There were a number of sheltered housing installations where, at Soundcraft’s suggestion, the “Winkhaus” AV2 multi point lock was used, as this particular lock has a pull down action to open the door which is easier for the elderly and frail to use. Soundcraft also influenced the specification of extended lever handle furniture, as well as a Cam Action door closer, which make the overall operation of the door easier. The FED doorsets installed were high performance, aesthetically pleasing products offering FD30S fire resistance and Secured By Design compliance. Many doorsets included overpanels and sidelights. The timber was supplied under the FSC® chain of custody scheme run by BM TRADA. In addition, the specification required that the doors were manufactured under the BM TRADA 3rd Party Certification Schemes for the Manufacture and Installation of Fire Doors. To find out more about the specification of Front Entrance Doors (FED), give Soundcraft’s technical team a call on 0800 988 1875, or read more case studies.